Refined luxury, personalized service and our ideal Rockville location across the street from Thomas Farm Community Center, walking and jogging trails are just a few of the many reasons why you’ll be excited to call Camden Fallsgrove home. Our spacious one, two and three apartment homes offer stunning upgrades like stainless steel appliances, mountain mist quartz countertops, espresso cabinets with frosted glass accents, porcelain tile backsplash, undermount sinks, crown molding, full-size washers and dryers and modern finishes throughout. Enjoy stunning views of beautiful greenspace and lush landscaping in addition to conveniences like door-to-door waste and recycling pick-up service and 24-hour emergency maintenance. Residents receive a technology package included with a savings of up to 48% off retail. This money-saving package includes high-speed internet up to 100 Mbps and over 140 digital video channels through Xfinity. Use the Xfinity Go app on your smartphone or tablet to access your digital video anywhere! Be sure to take advantage of the array of community amenities including an expansive fitness studio, resident lounge with billiards, executive business center, lighted tennis courts and spectacular resort-style pool. Premium amenities such as extra storage, attached and detached garages, bike lockers and rentable club rooms are also available to residents of Camden Fallsgrove. 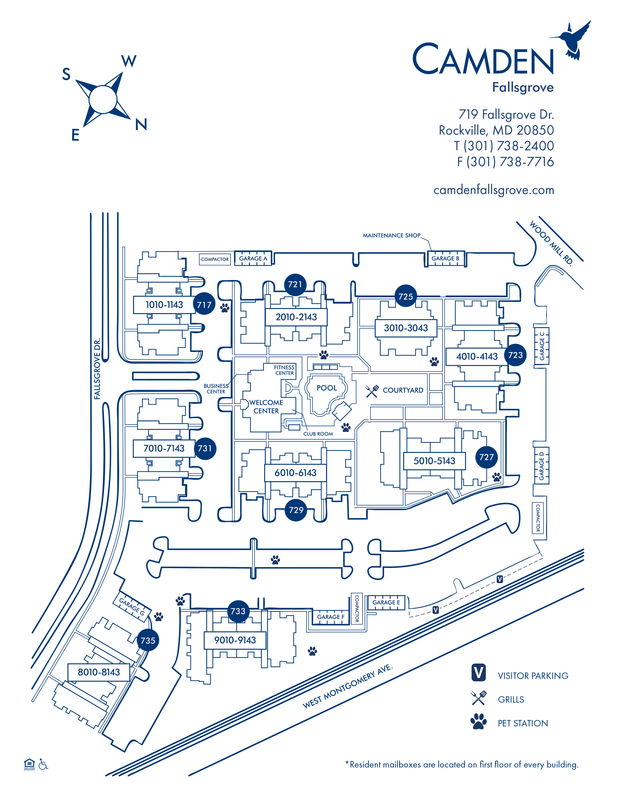 Our pet-friendly community is just minutes from Fallsgrove Village Center, Rockville Pike, across the street from bike share and convenient to Gaithersburg. Come home to Camden Fallsgrove in Rockville Maryland today! At Camden, your pets are family too! We welcome cats and dogs, up to two pets per apartment home, with a full-grown maximum weight limit of 80 pounds combined. Call us with any pet-related questions! We offer one parking permit per resident. We also offer reserved parking for $40 per month per space. Detached garages and breezeway garages are available to rent starting at $150 per month. We have ample marked visitor spaces too!